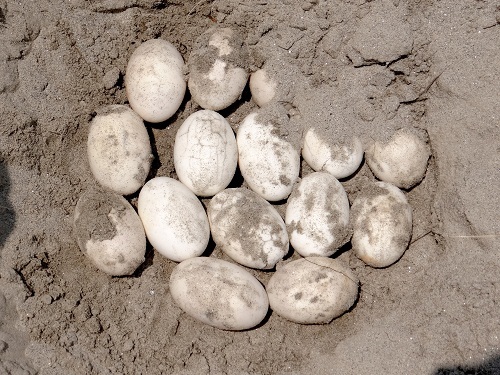 On this year’s World Environment Day, 5th June, with the heart-warming arrival of a few hatchlings a new breeding population for the gharial has been confirmed along river Gandak, in Bihar. This is crucial for the survival of this species. The Gharial(Gavialisgangeticus) is a critically endangered freshwater fish-eating crocodile endemic to the Indian sub-continent. As per IUCN their number was less than 200 in 2006, recent estimates suggest around 550 adults, and more than double if sub adults are counted (Tiger numbers in Indian are about 2226). This beautiful animal, endemic to the Indian sub-continent can reach a stupendous 7m (22 feet)length, it has a long snout that ends into a shape like a Ghara (pot) in the male, giving the reptile its name Gharial. 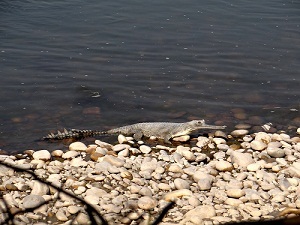 In India gharials have been reported in the Chambal, Girwa, Ghaghra, Gandak, Ganga, Sone and Ken though some of these population is very small or have effectively disappeared. They are primarily cold blooded fish feeders, and bask in the sun to warm themselves. Their life span is estimated around 50-60 years. 1. How did work on the Gharial start in the Gandak? I worked on the Gangetic Dolphin before joining the Wildlife Trust of India (WTI) in 2003. We hardly saw gharials during our dolphin surveys, though, on one occasion, we recovered a carcass of a young gharial in the Gandak, its tail was cut off. 2003 onwards whileworking in the Valmiki Tiger Reserve with WTI, I saw 7-8 gharials opposite Trivenighatalong the Nepal side of the river. Some 7-8 years back renowned gharial expert, late Dhruvjyoti Basu, fondly known as Basu da asked me about gharial sightings in the Gandak including in its Nepal stretch. 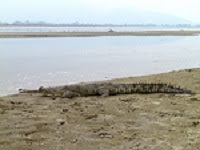 My sighting reports triggered a multi-organizational multispecies survey in the Gandak in January 2010which recorded a remnant population of gharials. Based on the survey findings,in 2012, the Bihar government sought WTI’s technical support to strengthen the gharial population.In fact, Chief Minister Nitish Kumar personally took interest and follows up on the project even today. The then Forest Secretary, Mr. Deepak Kumar Singh and forest officials took great interest and in 2014 therestockingofgharials in theGandak from the captive born stock at Sanjay Gandhi Biological Park, Patna was started. This is a Bihar Forest Department funded project, which reflects the commitment of the state.Senior Advisor to WTI, renowned crocodilian scientist Prof. B. C. Choudhury guides the project. 2. What makes the Gandak so special that gharials continue to survive and even breed? Just after entering India from Nepal, the river gets the protection of theValmiki Tiger Reserve on its left bank for about 45 km, andthe SohagiBarwa Wildlife Sanctuary in Uttar Pradesh for about 7-8 km along its right bank. Limited agriculture is done on the banks as very few villages are situated on the banks since the river keeps on eroding its sides, there are no major towns and cities along the river Gandak. The river channel is much braided, consisting of a network of many small channels separated by vast mid-channel islands, which are almost free from anthropogenic activities, fishing pressure is comparatively low. Such features provide a less disturbed habitat andgharialspopulations are still there. You would be happy to know that in a March 2015 survey Gandak had 54 gharials of which 26 were adult. With the recent arrivals the numbers are likely to rise. 3. The Gandak was once a happy Gharial ground, but numbers declined – why did this happen and what do we need to do to ensure that this does not happen again? Construction of a barrage across the river at Valmikinagar in late 1960s destroyed suitable gharial habitats downstream. After that, the region was taken over by anti-social elements. The law and order condition in the area was very poor, thismight have been the reason for no scientific studies in this region, gharials might have also been killed, nobody knows. After 2007-08, law and order situation in the Gandak floodplains was brought under control. Now we stay on the rivers for weeks without any fear, safety is very important for any conservation work. In due course of time the river geomorphology also got modified, probably favoring the gharials. 4. Releasing the Gharials, monitoring them and praying for their survival? How do you protect them? Since a wild population was sighted in 2010, we felt the need for strengthening it through restocking with sub-adult gharials, whose chances of survival and adaptation are better than young ones. Release sites were determined based on detailed habitat assessment surveys along 50-60 km looking at presence of anthropogenic disturbance, fish, sand banks and bars and natural gharial population. All released individuals are uniquely marked for identification, few are tagged with VHF and satellite transmitters and are monitored through the entire river stretch including important basking sites. The project is just 2 years old and we are still learning about gharials in the Gandak. Captive breeding and release is important but the most important is to keep the habitat safe and secure for the species. Sometimes as you start doing something special, it comes under formal and non-formal protective regime. Monitoring of total population, of the released ones, of human activities is important so isrecording the threats, change in geo-morphology of the river all of which determines the habitat use by aquatic animals. 5. How do captive bred sub-adults cope with release into the wild? We observed that captive bred individuals on release avoid going in the main current, they live in groups as they do in captivity for 7-8 days, after which they disperse. Even after living for so many years in a small pool in captivity, they are able to identify the natural habitat suitable to them. They use the areas which wild gharials already occupy with released and wild gharials basking together, it gives a lot of satisfaction. We have observed released ones moving more than 1000 km and entering into other rivers after 7-8 months of their release. 6. What are the biggest challenges and the ways to tackle them? The biggest challenge that I see is development activities. The recent news that the Gandak will be developed as an Inland Waterway is a great potential threat to the gharials. But, I am sure gharial presence will be considered when detailed studies and environmental impact assessment are conducted. We will raise this issue at the suitable platform. The Forest, Water Resources and Mines and Geology departments are important stakeholders.Along protected areas, we take the help of forest department staff, we train them in identification of species, monitoring, we inform them of stretches critical to the gharial and suggest actions to be enforced. Water of the Gandak is diverted for irrigation through canals. We need to work out how much a minimum flow of water is required for gharials and other species like Gangetic dolphins, and only then canwe move ahead. Working with the Water Resources department, which operates the barrage across Gandak is important to ensure water in the river. Though we have yet to see any major problem related to sand mining in this area, the Mines and Geology Department is another important stakeholder. Definitely, in the coming years rigorous planning for gharial conservation needs to be done keeping in mind stakeholder’s concerns and giving them space in the management regime. Till the gharial gets the support of the Chief Minister of the state I don’t foresee any difficulty in co-coordinating with other departments. Thus protection strategy is multi-pronged. However, despite efforts many a time disturbance occurs, which we should bear as a part of the system. In the current scenario we cannot expect a zero disturbance zone, especially in our river systems. WTI is committed to continue till we see that gharials are well established and the state functionaries are capable of managing on their own. Dearth of continued funding support for such species is always an issue, but, we will overcome this hurdle. 7. What are the difficulties of working on river systems? I have worked in both systems, there are more difficulties working in river systems. For forests there is a department which has priorities for the ecosystem, there is no such custodian in case of rivers. 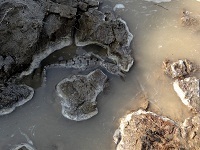 There are several conflicts among river water resource users and stakeholders. A river governance structure needs to be created and streamlined through policy interventions. 8. How important is the involvement of local communities and how best can they be involved? Though in the Gandak area, there are very few villages, and most of the farmers and fishermen are active in the river areas for a very limited period, their involvement is very important. We involve local fishermen in our surveys and interact regularly with fishermen and farmers along the bank. When they see gharial monitoring teamsoften, they respect your effort and also avoid directly disturbing the animal,they spread your word to others. Our boatmen, our farmers with whom we lunch and dine during surveys and field work, are the brand ambassadors for gharials. During night stays on the river’s banks we discuss the threats to gharials and other aquatic life with the farmers. They give us much past information about river condition and historical presence of gharials and other aquatic species. Their role in nest protection is very important, since they are the people living closest to the gharial nests. We see a great scope in developing community managed in-situ hatchery for gharial and turtles in the area. This will help the villagers earn while conserving these species, it will help establish bonds with the species, which means a better future of the species. 9. How is the gharial perceived by humans?Does the gharial show up in the Indian sub-continents mythology – can such associations be used to generate greater empathy and protection? Those who have not actually seen the gharials typically perceive them as dangerous.Human-mugger conflict is significant, and most of the people think of the gharialsame as the mugger. Those who live along the river know that gharials do not harm them, but they are afraid of it due to the size of the animal. There are many mythological associations, to many the gharial is the Vahana (vehicle) of the River Goddess Ma Ganga, others revere it as a vehicle of Varuna, the ‘God of Water’. It is also said that while preaching the Geeta to Arjuna, Sri Krishna said ‘Amongst aquatic life forms, I am the gharial’. How effective such associations would bein the current scenario where consumerism and immediate gains rule is a question butwe need to associate mythologies with ecological values of the rivers and life forms in themand the role of indicator species like the gharial and Gangetic Dolphins. 10. Is there any special moment carved in your memory related to this project? I can’t describe the thrill seeing a half dug nest by a gharial, we were camping on the river bank and at a distance of about 100 m from our tent a gharial dug her nest in the evening. There are many other momentsthat will stay for a lifetime;release of the first batch of gharials, the first individual fitted with satellite tag entering the Gandak after almost 9 years in captivity, your released animal basking with a wild gharial. 11. As a lay reader and wildlife enthusiast living the urban life how can one make a positive contribution to the Gharial? Theyare many ways, raise your voices on the issues and threats at regional or national level; visit the gharial bearing areas to know more about this less popular species, it will also help convey the message of its importance to the local communities and authorities; contribute towards field level conservation actions by volunteering, funding support, and help the communities dependent on gharial habitat for sustenance. Gharial conservation needs all skill sets, integrating your knowledge and expertise in doing something innovative for the conservation of gharial and its habitat.